FATHER TOM FUSCO...THEN AND NOW! Father Tom Fusco may have spent only five years as a priest at St. Patrick’s, but in those years, he developed lifelong relationships with the students and their families and formed such a strong bond with the Parish that it feels as though he has never really left us. We were fortunate enough to receive Fr. 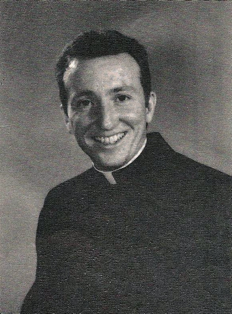 Tom in 1985, just as he was beginning his life as a priest at the age of 26. He quickly became a beloved member of the Parish and school. If you were a student at St. Pat’s in the mid to late 1980s, you no doubt remember and admired Fr. Tom. He was a daily presence in our lives. We were drawn to his gentle and kind nature, his terrific sense of humor and the wisdom he possessed--even at his young age. If you are in your late 30’s or early 40’s, you probably also remember Youth Group, something which Fr. Tom was very proud to have started. He celebrated 7:00pm mass every Sunday and soon, that mass became youth-focused. Seminarians were invited to provide the music and afterward, Youth Group would meet over at the school for presentations and prayer. Fr. Tom recalls when New York Islanders Pat LaFontaine and Pat Flatley came to speak to the kids and helped kick-start attendance of the group, which soon skyrocketed! Group discussions on topics important to teenagers, ski trips and two mission trips to Appalachia were other special memories. Youth Group lasted for many years and was a wonderful opportunity for the students and recent alumni of St. Pat’s to gather together to celebrate our common threads - our youth and our Catholic faith! Fr. Tom also has tremendous gratitude for how supportive the priests and the Sisters at St. Patrick’s were of him, particularly Monsignor James Richter. He also noted how welcoming and gracious Fr. Denniston and Monsignor Bennett and the other St. Patrick’s priests are when he returns. In the 23 years since Fr. Tom left his first assignment at St. Pat’s, he has accomplished much. When he left us in 1990, St. Jude’s in Mastic Beach was lucky enough to have him as part of their Parish. In 1992, Fr. 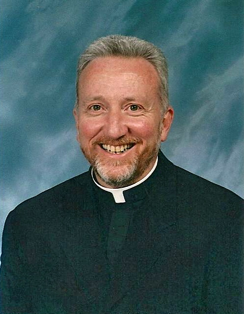 Tom was appointed to the role of Dean of Seminarians at the Seminary of the Immaculate Conception, where he himself had studied to become a priest. Being that the Seminary is just a few miles down the road from St. Patrick’s, we were lucky enough to once again have Fr. Tom back in our community. He spent the next 10 years at the Seminary. During that time Fr. Tom was able to pass on to future priests everything that he had learned about being a good priest. It was a great assignment for him because he was able to encourage other young men to share their faith and their willingness to serve the Church. And he was a great example for them. In 2002, Fr. 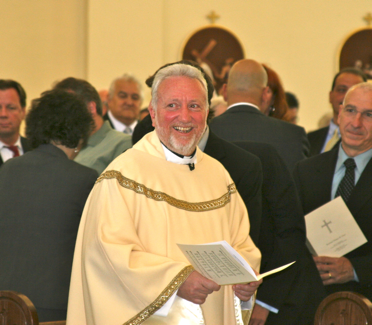 Tom was called to become the Pastor of St. Edward the Confessor in Huntington’s neighboring town, Syosset. He has been at St. Edward’s for the last 11 years and he has found his time there to be extremely fulfilling and rewarding. Upon arriving at St. Edward’s there was much to be done. A new church building had to be built, for starters! Having a new pastor with a new church building gave that community a new start. Fr. Tom describes his experience as being given an opportunity to build on a strong foundation (literally and figuratively) that had been created by those who went before him. Just as he was at St. Pat’s, Fr. Tom is heavily involved in the daily lives of the students at St. Edward the Confessor School. He has formed bonds with the families of the school and Parish that will also no doubt last a lifetime. When Fr. Tom isn’t running St. Edward’s Parish, he enjoys spending time with his large extended family. He spends time at his family’s home out east in Jamesport and has traveled extensively both within the United States and overseas. His trips in recent years have taken him on a continuing tour of the baseball stadiums in the U.S., the Grand Canyon, the Dominican Republic, London, Lourdes, Paris, to Rome several times, and to the Holy Land. His next adventure is to India this April. Fr. Tom is now coming up on his 28th anniversary as a priest. He had a wonderful celebration 3 years ago at his 25th Jubilee, which several St. Pat’s families were lucky enough to attend. Fr. Tom has indeed always remained connected to St. Patrick’s over the past 28 years. He truly enjoys coming back to celebrate Mass here whenever he can. He has married many St. Patrick’s alumni and also returns to baptize the many babies of those couples! He says he also feels privileged to be asked to come back and say the funeral masses for families he has known over the years. We hope Fr. Tom knows that it has been our privilege to know him and we feel truly blessed that God placed him in our lives all those years ago. Fr. Tom is very much looking forward to the St. Patrick’s School reunion coming up this June at the Seminary. He has graciously accepted the invitation to concelebrate the kick-off Mass with Monsignor Bennett and hopes to see many of his old friends there!